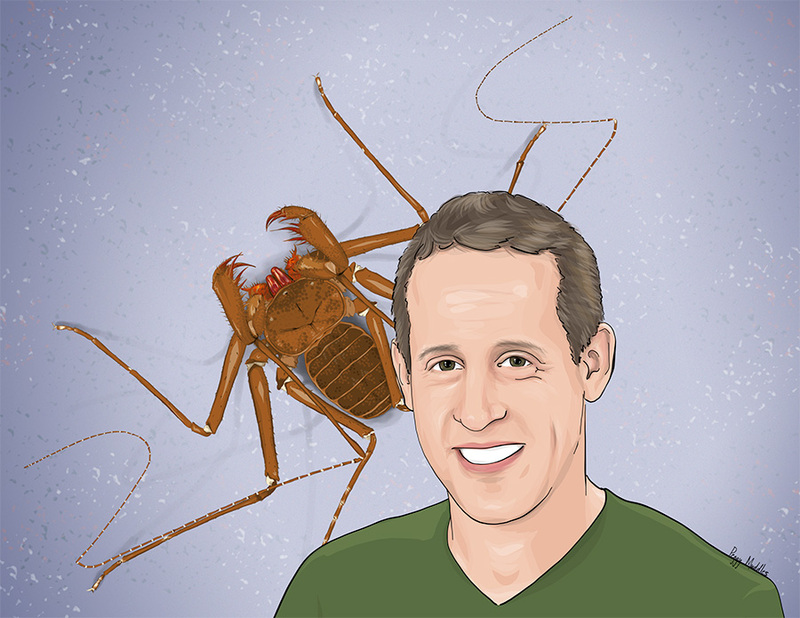 When I was a kid I used to spend hours in the Israeli outdoors, looking for insects and arachnids in hopes to familiarize myself with as many arthropod species as possible. I was so darn good at finding small critters that soon enough friends requested to tag along to see what I could unearth during a short afternoon hike. My parents recognized my growing passion and got me the natural history “bible” at that time – the 12 volumes of Plants and Animals of the Land of Israel: An Illustrated Encyclopedia. I studied it carefully, trying to set goals to find certain species, which led me on excursions throughout the country. Yet one arachnid seemed to remain out of reach. It looked like a cross between a mantis and a spider, with one long pair of appendages. It was an amblypygid, a whip spider. 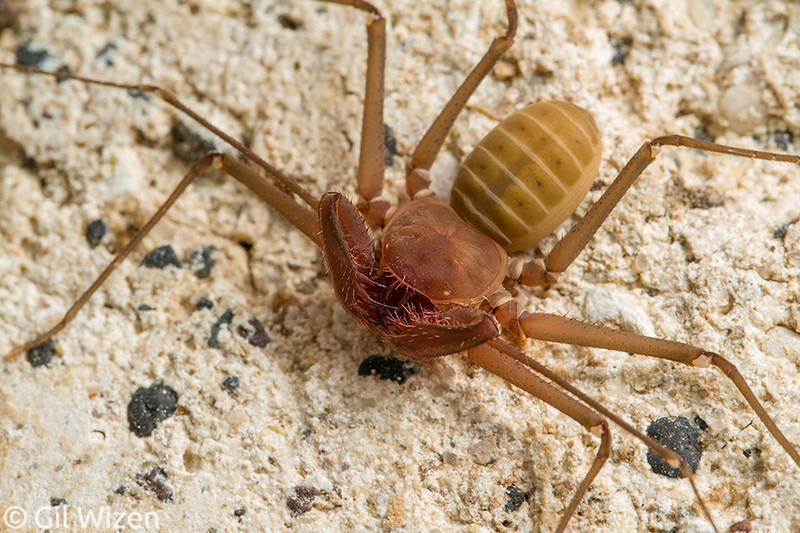 The book listed only a single species occurring in Israel, Charinus ioanniticus, very rare. It featured a tiny photo, followed by a large illustration on the opposite page, a replication of the photo. In the days before the internet, that was my only reference for this arachnid group. 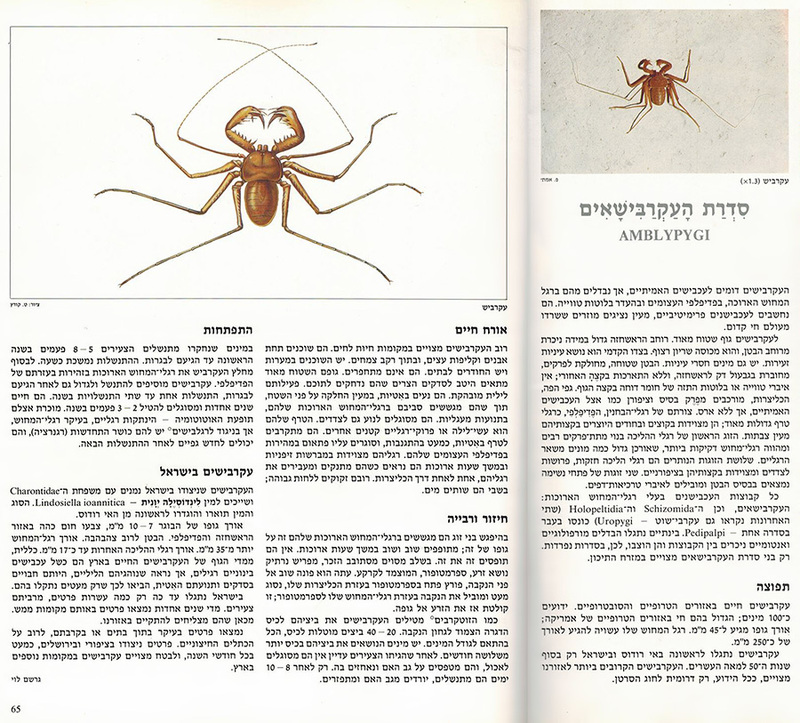 Amblypygi in: Plants and Animals of the Land of Israel: An Illustrated Encyclopedia, Vol. 2 Arachnids. For nearly a decade this was my only reference for information about whip spiders. I was determined to see a live one, but I always failed to find them. I kept looking at those pages in hopes to memorize every aspect of the animal, making sure I can confirm its identity in case I stumble upon one. Years have passed and I gave up on finding one in the wild. I did get a chance to see a live specimen during my high school days though, in one of the visits I paid to Pinchas “Pini” Amitai, the man who took the original photo in the book. Little did I know that 20 years into the future I would be involved in discovering a new species of whip spider living in Israel. This discovery is not recent news. We found the new species over five years ago, and the formal description was published last year. The media intended to feature the story, but unfortunately a former president in Israel passed away on the same week the paper was published and there was no interest in a story about an obscure arachnid living inside caves in Israel. Despite that, I waited. The discovery is an important one, and I was hoping our new species could still make an appearance in the news. And as you can imagine, I am still waiting. Well, as the old saying goes – if you want something done, you have to do it yourself. So let me tell you the story of this cute arachnid. Back in 2012 I stumbled upon a photo of a whip spider from Israel in one of my social media newsfeeds. The photo was taken by Dr. Eran Levin during a cave survey for his research about bats’ hibernation sites. Since I had an approaching trip to Israel I contacted my friend and asked if he would share the location, because I was still hoping to see and document a wild whip spider in my home country. 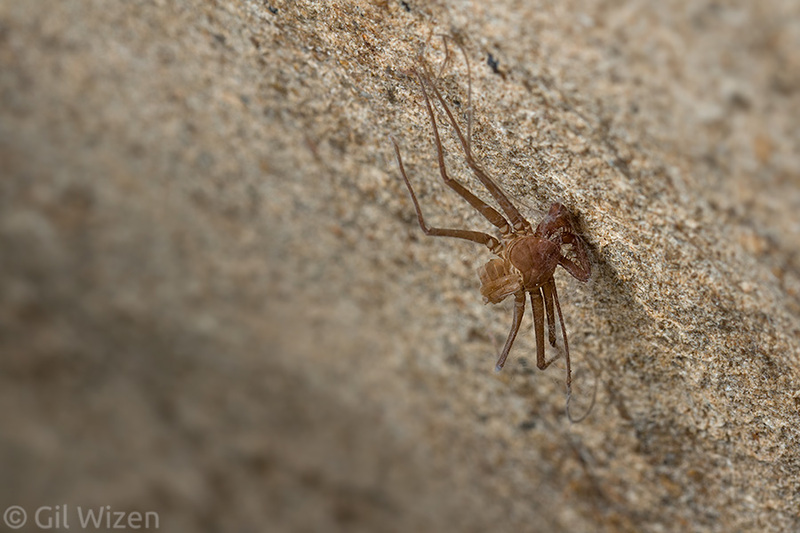 We chatted for a while, the location was a bit unexpected for amblypygids in the area, but a few months later I found myself crawling through a tight opening into the warm cave. And indeed they were there, happily roaming on the walls, waving their magnificent long legs everywhere. 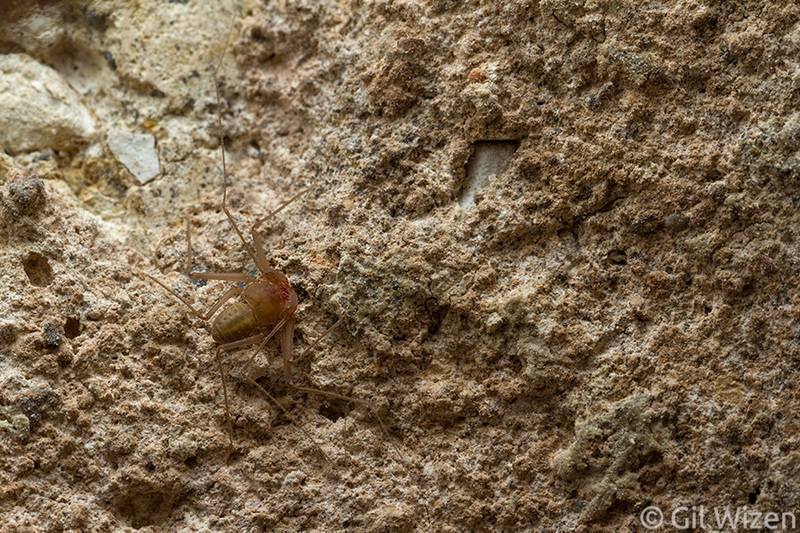 Molts hanging from the cave’s ceiling are a good sign for an active whip spider population. Charinus israelensis cleaning its leg. This specimen lost two of its legs in fights with others (see example below). They will grow back the next time it molts. I took some photos and happily went home. When I inspected the photos later, something did not sit right with me. I still had a vivid memory of the photo and illustration in the book from my childhood. But now, I could also use information online for confirmation. 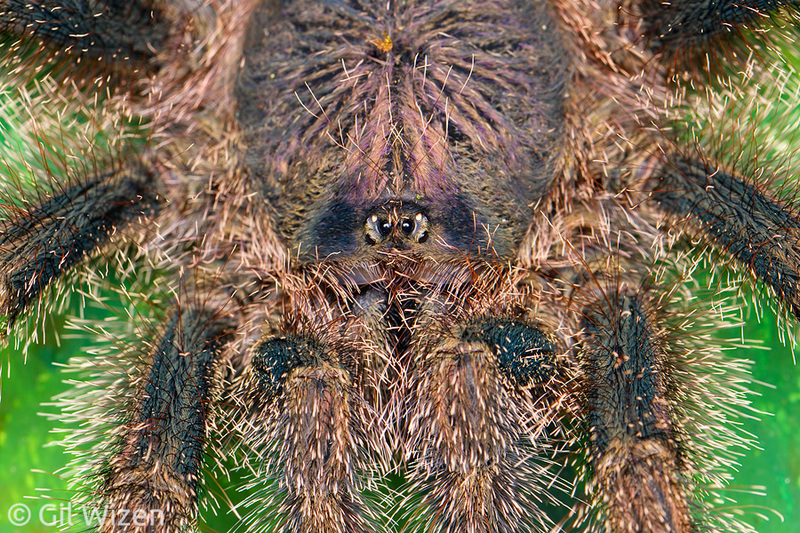 The amblypygid species known from Israel, Charinus ioanniticus, has well developed median eyes. It almost looks like it is crossed-eyed. How cute. Charinus ioanniticus’ big smile. See the tiny beady eyes? Adorable! I looked at my photos, and none of the animals had median eyes. What is going on here? 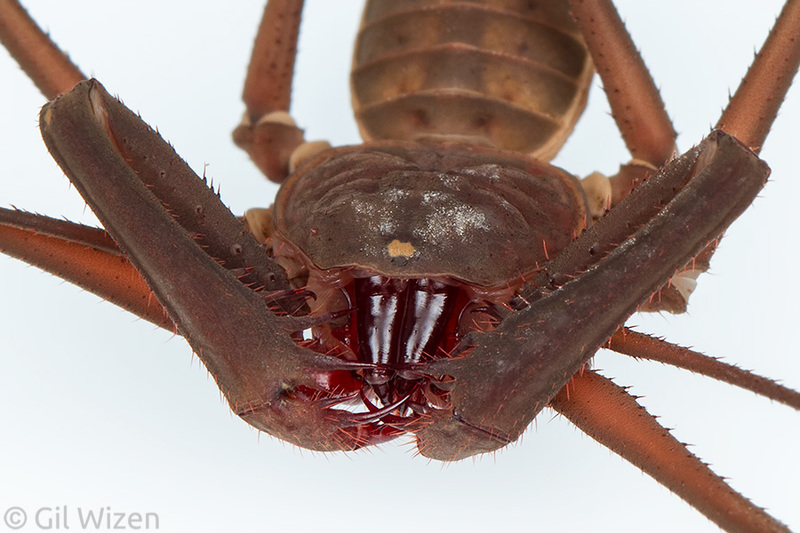 In all other visible aspects the whip spiders looked like C. ioanniticus, yet the absence of eyes was enough for me to suspect that I might be dealing with a new species. I made some calls, went back to collect some specimens, and started the long process of verifying and describing the species with colleagues (you can find our paper on my publications page). I invested my energy and personal funds into that research. For me it was a mission to put the spotlight on this exciting new find. We named it Charinus israelensis. I became heavily involved with the general public and posted requests in forums and social media groups for any records or sightings of whip spiders in Israel. Slowly but surely, I started receiving responses from various people located throughout the country. 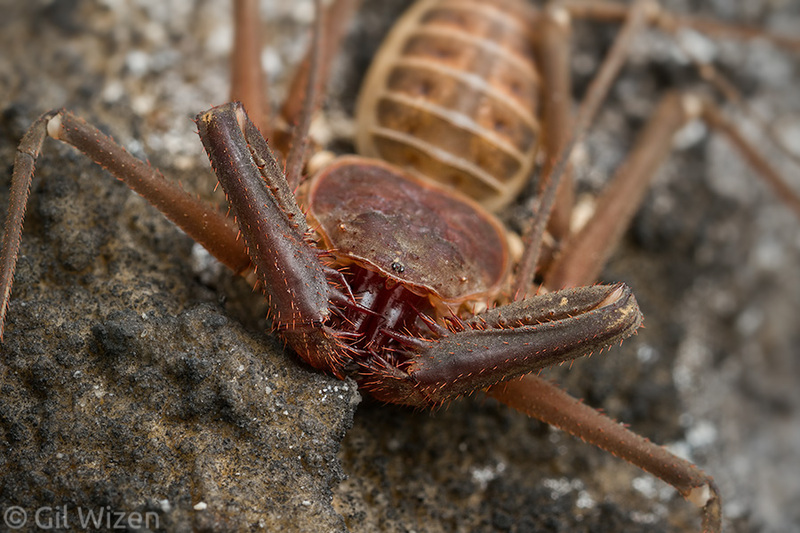 Some of which mentioned whip spiders that found their way into homes, others were reported from natural caverns. It was even more interesting to visit some of those places with the people who made the sightings, and witness the whip spiders’ populations together with them. I learned a lot about caves in Israel, and how much we still don’t know about these habitat systems. But the best experience for me while searching for the new species C. israelensis was to discover new unrecorded populations of the known species, C. ioanniticus. And more than anything, I suddenly realized that they are not at all that rare as mentioned in the old encyclopedia. They are just extremely cryptic, remaining hidden in tight crevices and coming out in the darkest of nights. No wonder people never see them. Why is this exciting? There are two main reasons. 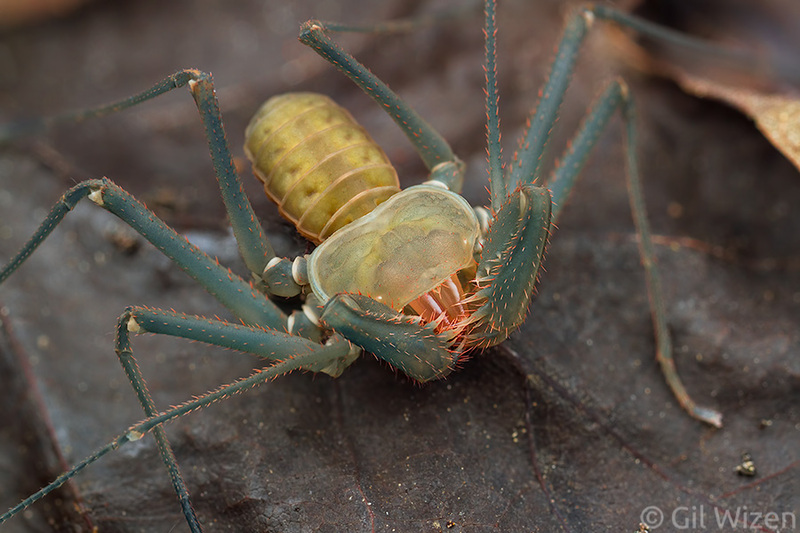 The first one is that this discovery doubles the Amblypygi fauna for Israel. It may not sound much, but jumping from one species to two is actually a big deal. 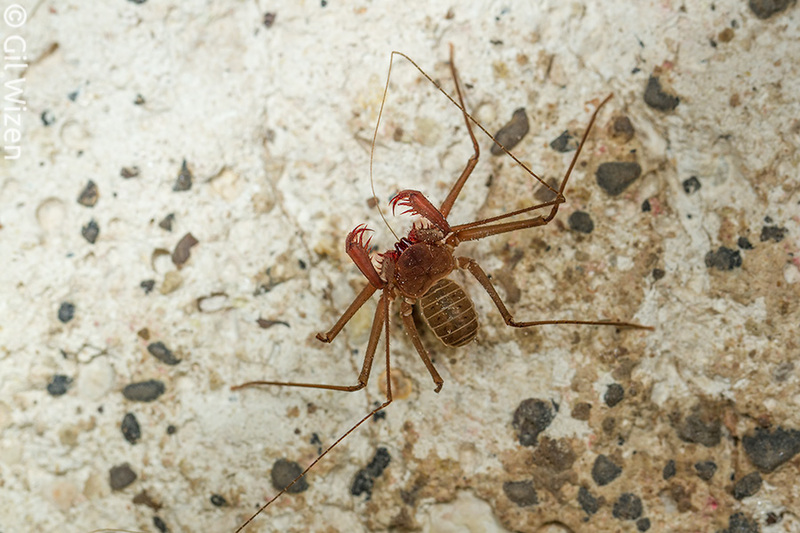 It has implications on our understanding of food webs in caves, and these unique arachnids may give further incentives to protect and conserve cave habitats in Israel. The second reason is that the loss of eyes in cave animals (troglomorphism, a term associated with adaptation for life in dark caves) is an interesting topic for studying the evolution of traits within a phyllogenetic lineage. 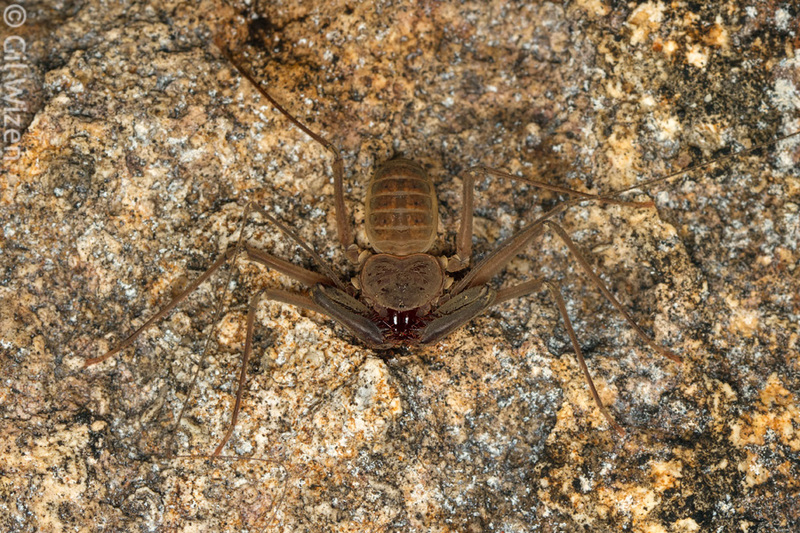 There are already several examples of blind Charinus whip spiders from around the globe, which may lead to fascinating research in the future. In the meantime, I continue to keep live specimens of both Charinus species from Israel, learning a ton about their biology in the process. 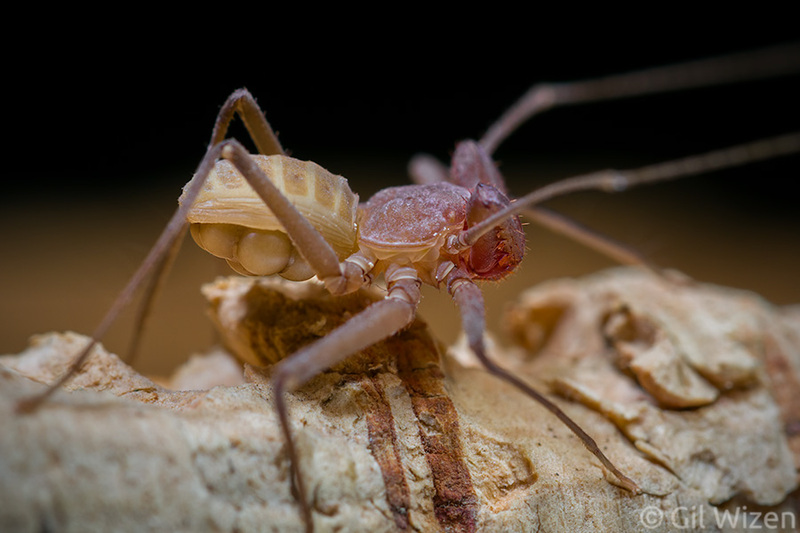 A freshly molted Charinus israelensis shows spectacular coloration. The color turns reddish-brown after some time. Two females of Charinus israelensis fighting. 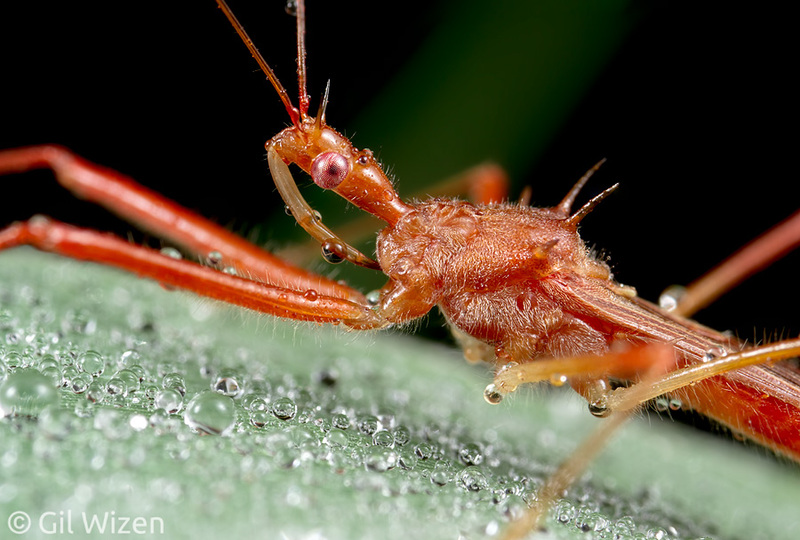 Whip spiders have complex communication based on movements of their antenniform legs. Some encounters turn hostile, in this case because the bottom female was gravid. 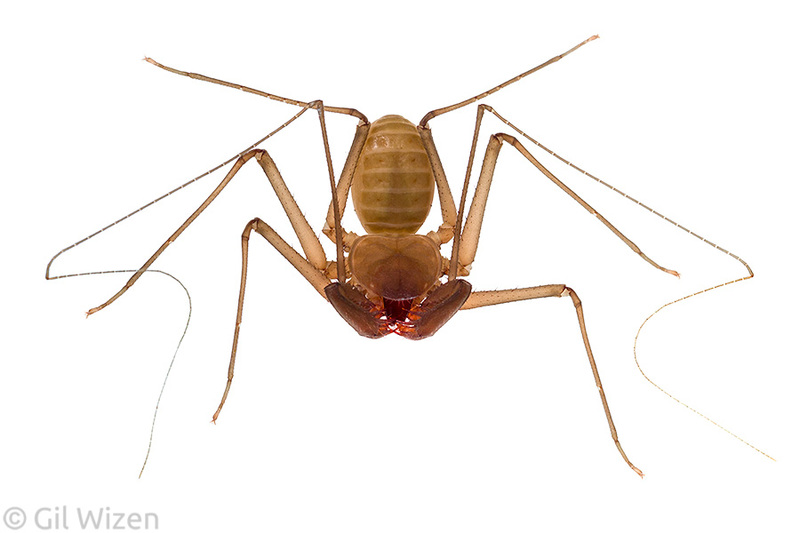 Some of the adult whip spiders that were collected in the beginning of the research are still alive and kicking! Quite impressive for a small arachnid, and seems like they can even outlive some of the more “conventional” pets. 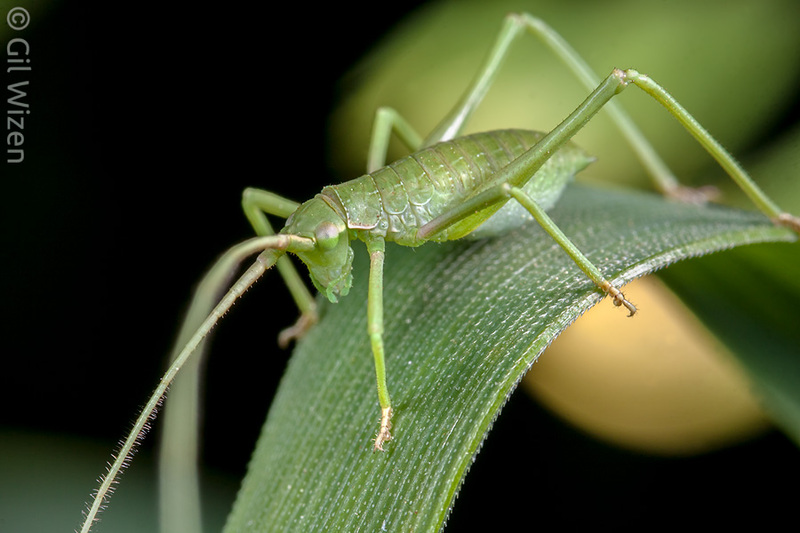 By the way, this weekend (Sunday August 27th, 10am-5pm) the University of Guelph is holding a “Bug Day” at the Arboretum Centre. Come for a fun day out and learn about arthropods. I will have a table with whip spiders, so please drop by and say hi. 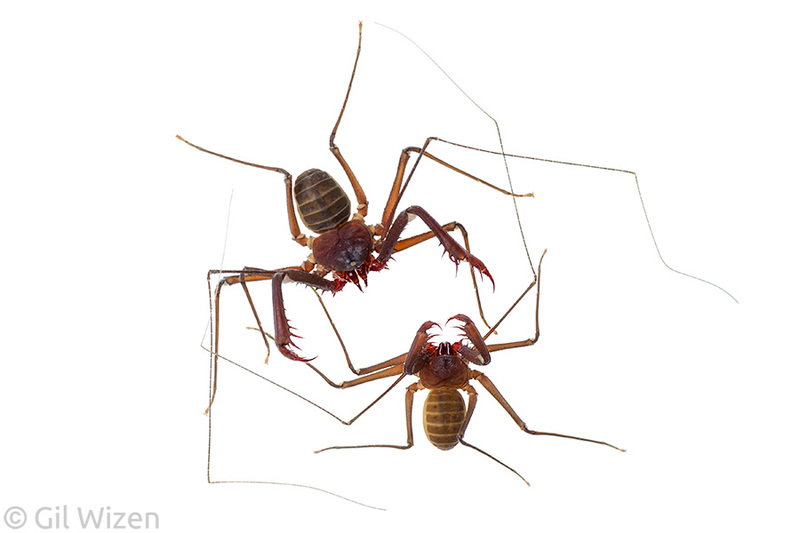 I will also have some framed whip spider molts with me so please come and check them out! I have one of that species. I found it Here in the PHILIPINES.